Upon their arrival at the Wynford Drive site, Mawlana Hazar Imam and Prime Minister Stephen Harper were greeted by members of Hazar Imam’s family. 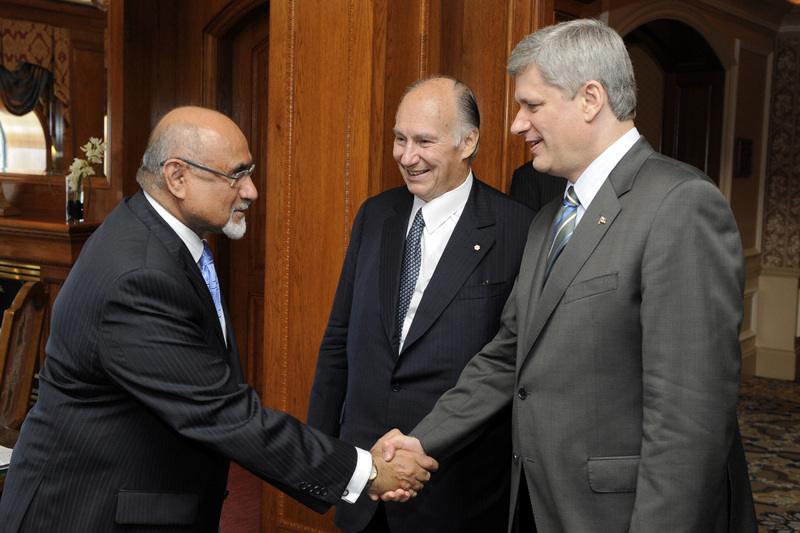 Mawlana Hazar Imam presents Prince Rahim to Prime Minister Harper. Mawlana Hazar Imam presenting Prince Hussain and Princess Khaliya to Prime Minister Stephen Harper, upon Hazar Imam and the Prime Minister’s arrival for the Foundation Ceremony in Toronto. Arriving at the Wynford Drive site for the Foundation Ceremony, Mawlana Hazar Imam and Prime Minister Stephen Harper walk through the Welcome Tent. 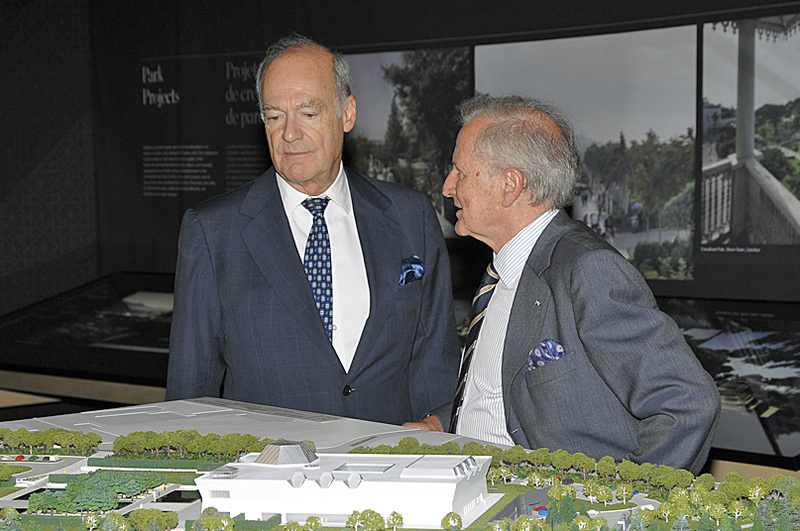 Prince Amyn and Luis Monreal, General Manager of the Aga Khan Trust for Culture, discuss the architectural model of the Ismaili Centre, the Aga Khan Museum and their Park. Ismaili Council for Canada Vice-President Malik Talib with Princess Khaliya, pointing out details of interest on the architectural model of the Wynford Drive projects. 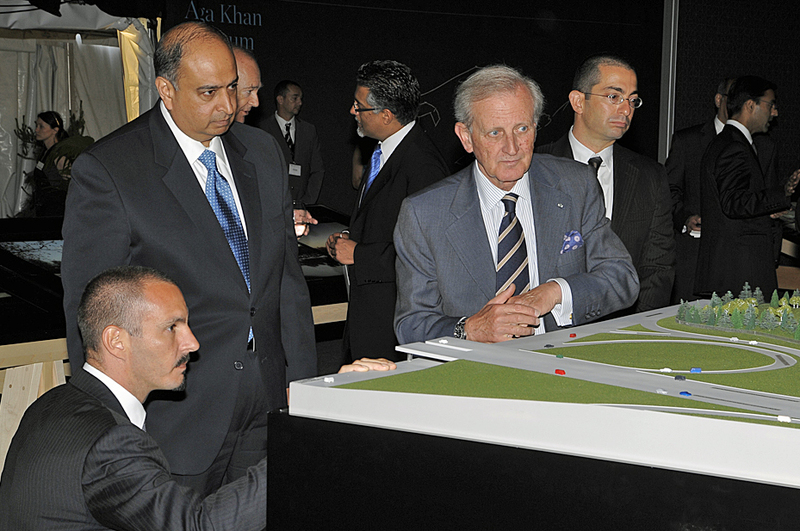 Prince Rahim gets an eye-level look at the architectural model, as Ismaili Council for Ontario President Karim Sunderji, AKTC General Manager Luis Monreal and landscape architect Vladimir Djurovic look on. 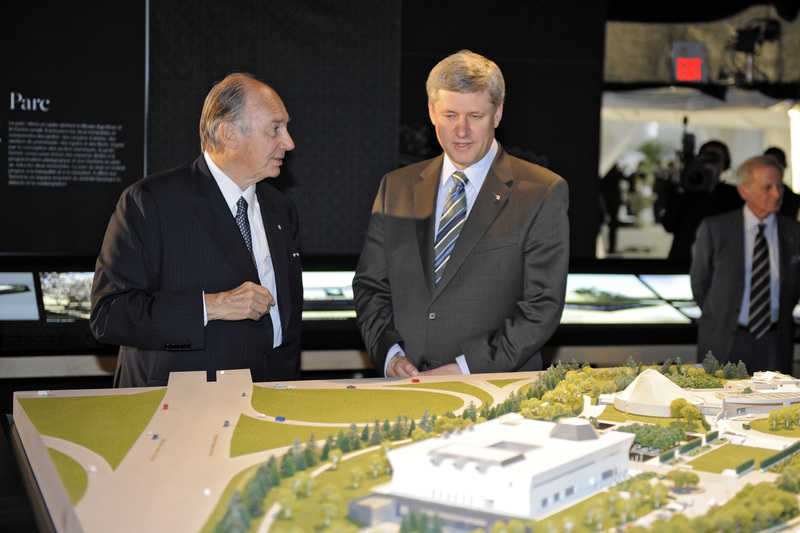 Mawlana Hazar Imam and Prime Minister Stephen Harper in the Exhibition Tent, examining the architectural model. 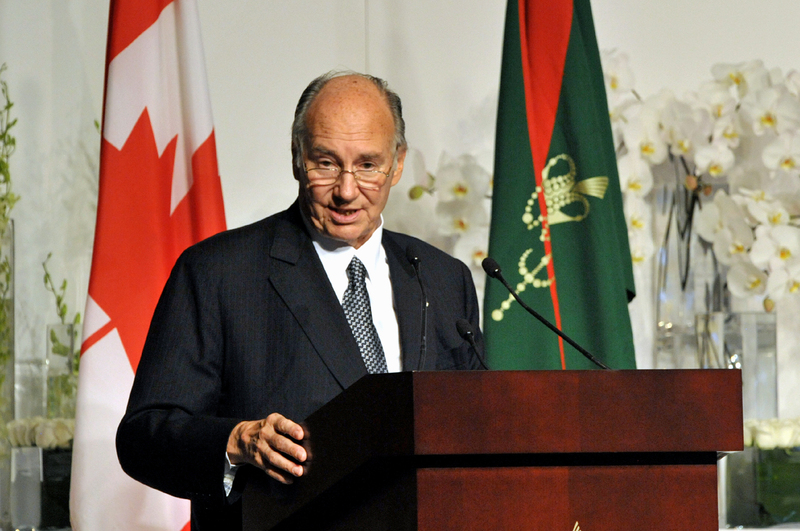 Mawlana Hazar Imam addresses the gathering at the Foundation of the Ismaili Centre, the Aga Khan Museum and their Park in Toronto. 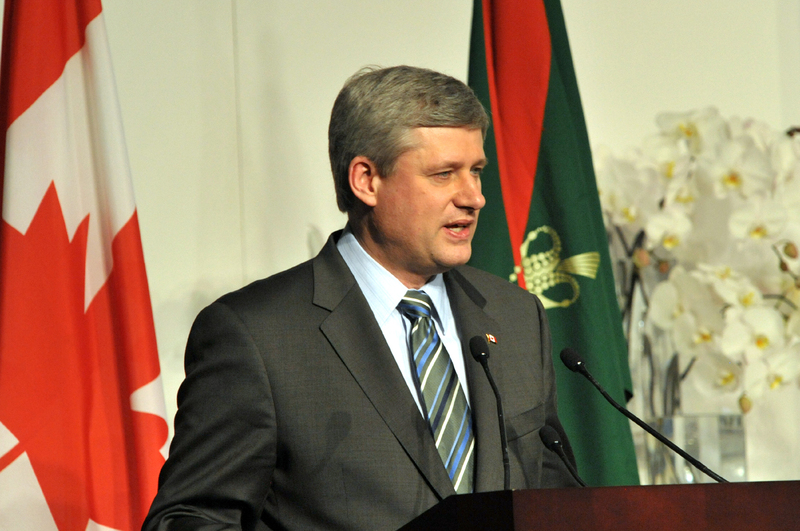 Canadian Prime Minister Stephen Harper speaking at the Foundation Ceremony in Toronto. 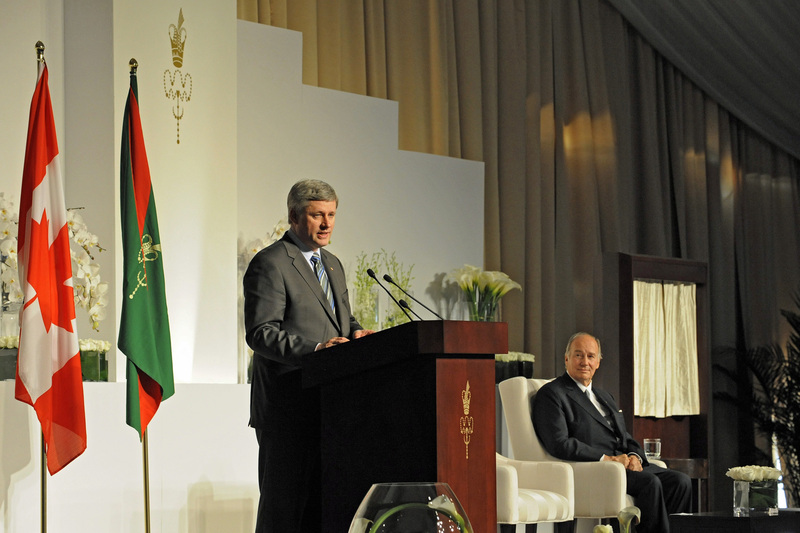 Prime Minister Stephen Harper addresses the gathering at the Foundation Ceremony in Toronto, in the presence of Mawlana Hazar Imam. 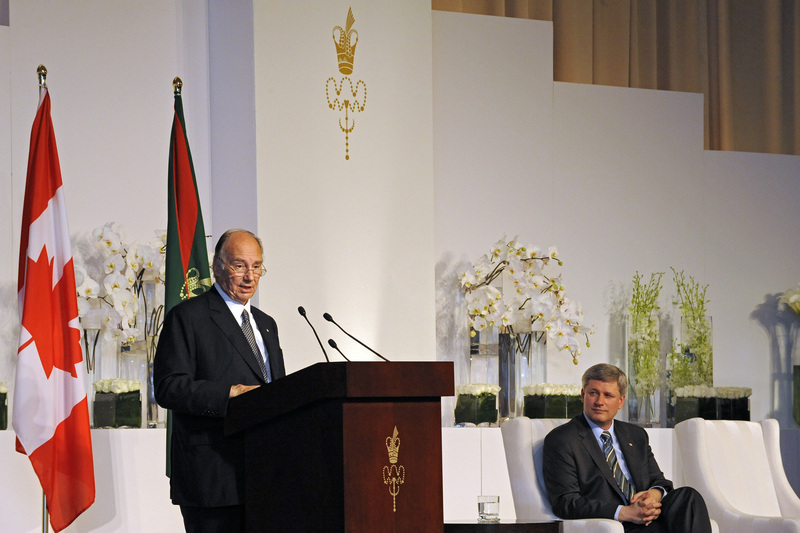 Mawlana Hazar Imam speaking at the Foundation Ceremony, where Prime Minister Stephen Harper was the chief guest. 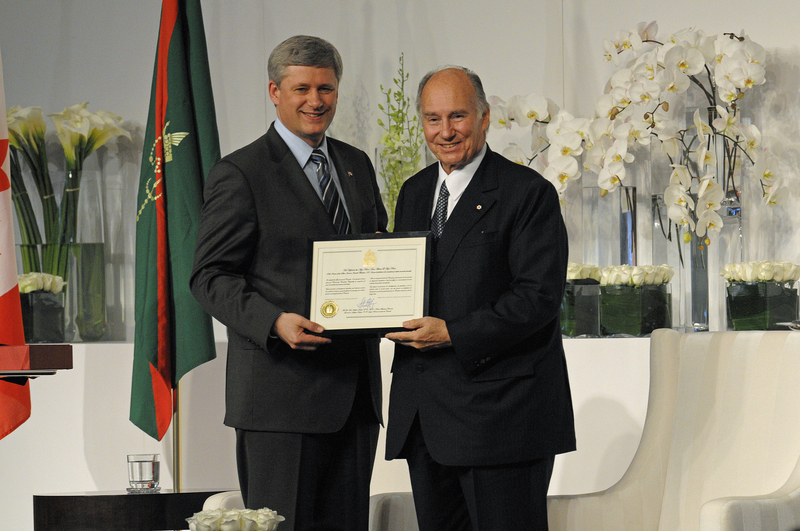 Mawlana Hazar Imam receives a certificate of Honorary Canadian Citizenship from Prime Minister Harper. 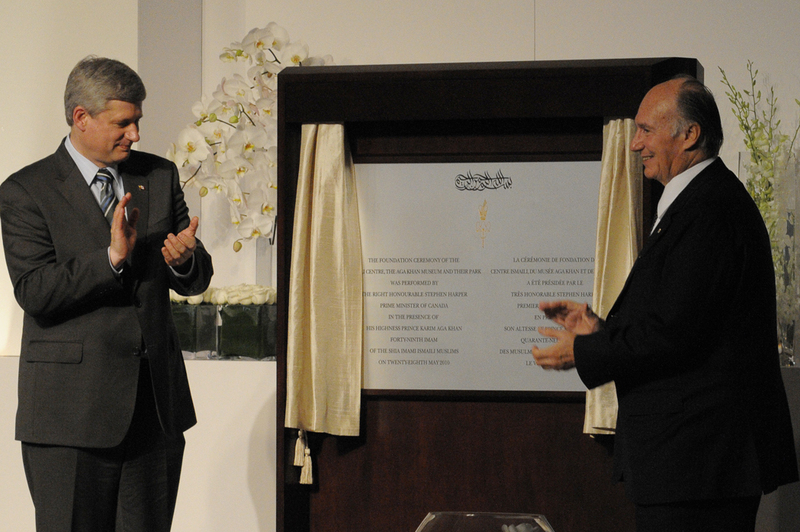 Prime Minister Stephen Harper and Mawlana Hazar Imam applaud after unveiling the plaque commemorating the Foundation of the Ismaili Centre, Toronto, the Aga Khan Museum and their Park. 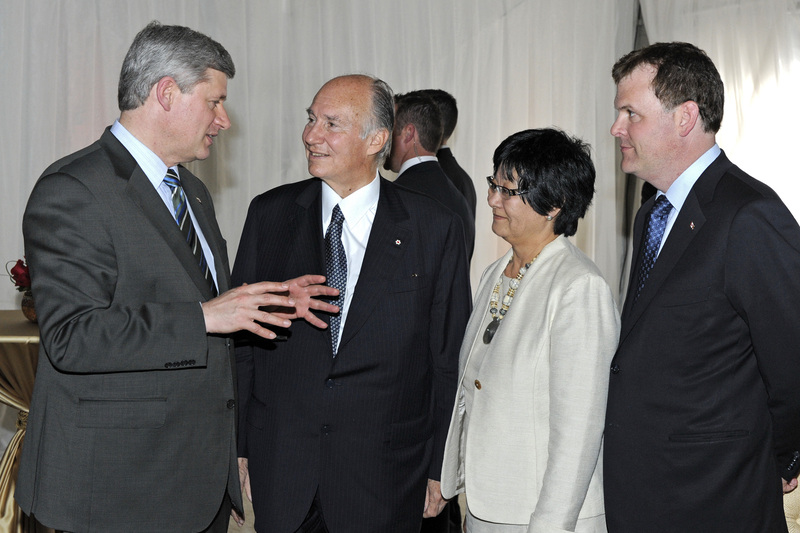 Prime Minister Stephen Harper and Mawlana Hazar Imam in conversation with the Honourable Ministers Bev Oda and John Baird. 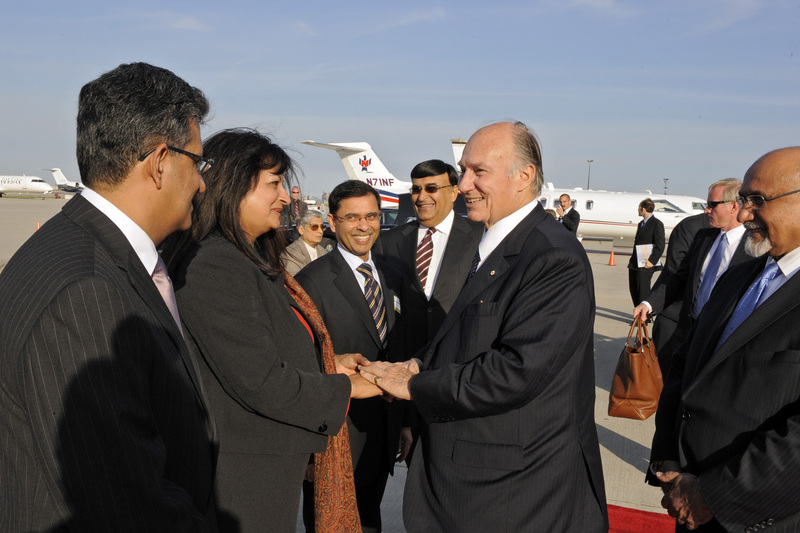 Jamati leaders bid farewell to Mawlana Hazar Imam as he prepared to depart Canada following the Foundation Ceremony in Toronto. 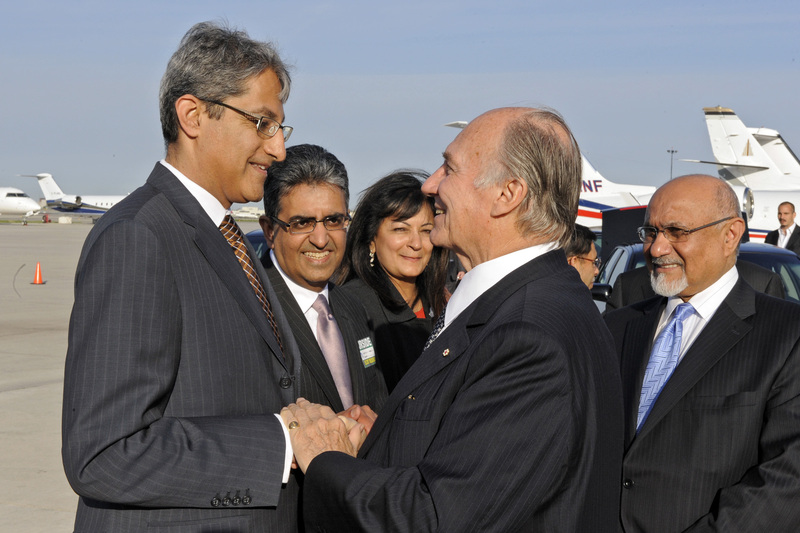 Mawlana Hazar Imam is bid farewell by Ismaili Council for Canada Vice-President Malik Talib and President Mohamed Manji before departing Canada. Mawlana Hazar Imam and Prime Minister Stephen Harper shake hands after unveiling the plaque commemorating the Foundation of the Ismaili Centre, Toronto, the Aga Khan Museum and their Park. 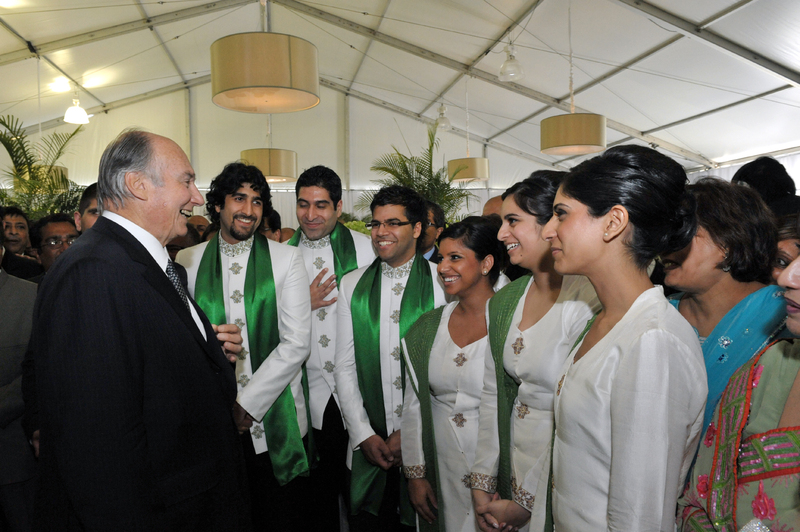 Mawlana Hazar Imam speaks with members of the Canadian Ismaili Muslim Youth Choir, who had performed earlier in the afternoon. Mawlana Hazar Imam introduces Ismaili Council for Canada President Mohamed Manji to Prime Minister Stephen Harper, ahead of the Foundation Ceremony in Toronto. 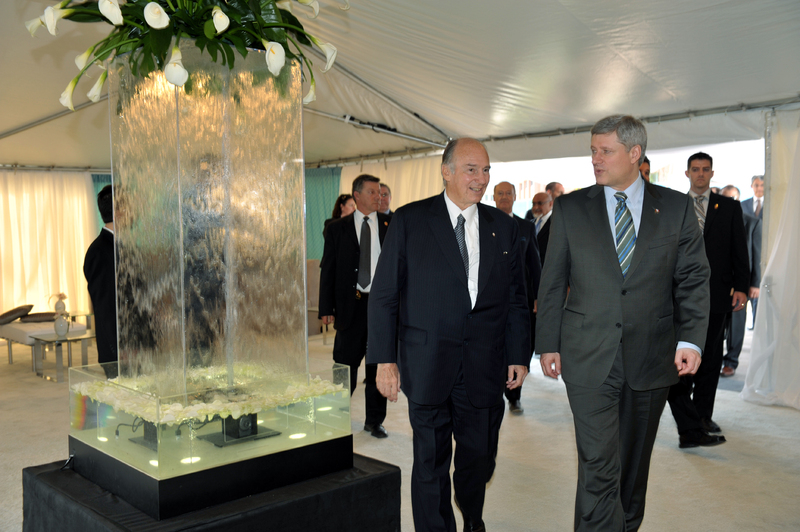 Mawlana Hazar Imam and Canadian Prime Minister Stephen Harper mark the Foundation of the Ismaili Centre, the Aga Khan Museum and their Park situated in Toronto’s Don Mills area. The Prime Minister used the occasion to formally announce the Canadian Parliament’s unanimous decision to make Mawlana Hazar Imam an Honorary Canadian Citizen. 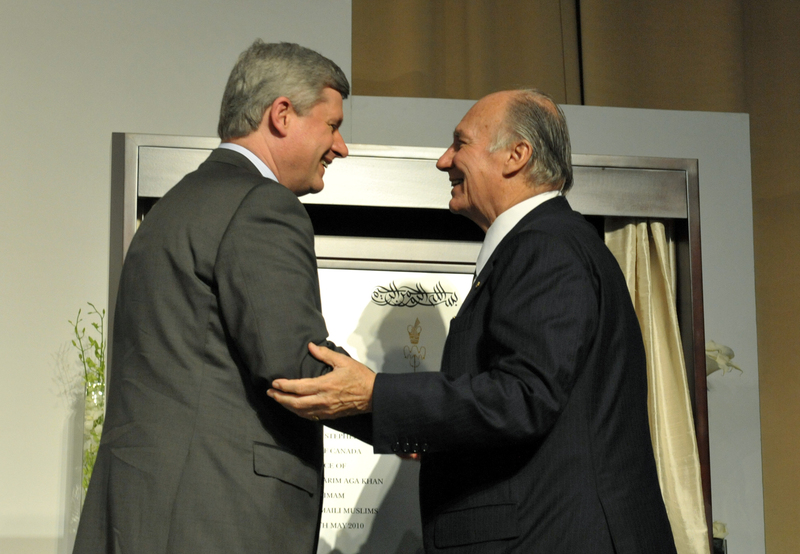 On 28 May 2010, Mawlana Hazar Imam and Canadian Prime Minister Stephen Harper marked the Foundation of the Ismaili Centre, the Aga Khan Museum and their Park situated in Toronto's Don Mills area. The Prime Minister used the occasion to formally announce the Canadian Parliament's unanimous decision to make Mawlana Hazar Imam an Honorary Canadian Citizen.